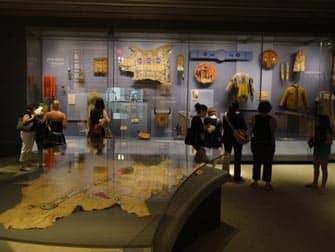 The National Museum of the American Indian in New York is certainly worth stopping by: for people who are visiting the city for the first time, but also for those who have been to New York more often. The National Museum of the American Indian is part of the Smithsonian Institution in Washington D.C., the biggest museum and research complex in the world, run by the American government. And that’s what makes the National Museum of the American Indian so nice to visit: it’s absolutely free. But there are more reasons to visit the museum. 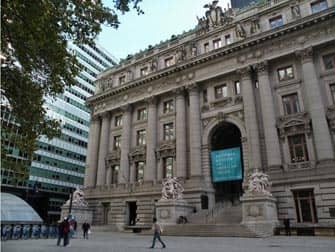 If you take the subway line 4 or 5 to Bowling Green or the subway line 1 to South Ferry, once above ground, you can’t miss the beautiful building. With its columns on both sides and huge frontal stairs, the U.S. Custom House, where the museum is housed, looks a lot like a Greek temple. The building is not only beautiful but has a rich history. It was built on the remains of the Fort Amsterdam that the Dutch built in 1625. The fort was built to protect the nearby harbour of New Amsterdam. It also became the meeting place of the Dutch and the Native Americans who exchanged their animal skins and knowledge of the seas and trade routes. Unfortunately, this contact wasn’t always peaceful and even the English, to whom New Amsterdam was sold in 1664, had trouble with the Indians. Thus, that the National Museum of American Indian is housed in the U.S. Custom House is not purely coincidental. Where the Dutch first met the Indians in the 17th century, now today, four centuries later, you can tread in their very footsteps. The permanent museum exhibition “Infinity of Nations” shows the history and art of the various Indian nations. 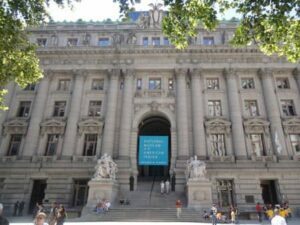 It is but a selection of the millions of objects that the wealthy New Yorker George Gustav Heye (1874 – 1957) collected during his travels through North, South and Central America. On the first floor, where you enter the museum, at the end of the oval hall you will find the entrance to the exhibition. 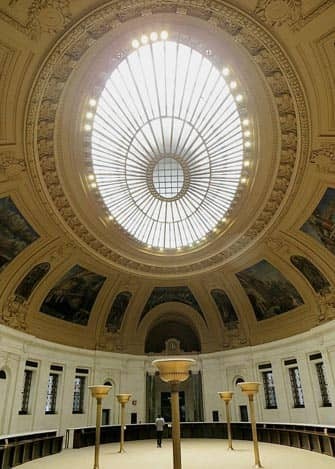 Do not forget to look up before you enter the exhibition as the ceiling of the oval hall has been beautifully decorated with paintings of the former harbour. Once inside the exhibition, you can view the various clothes, utensils and artworks of the Indians, each divided per habitat. Start for example in the middle, where you can learn more about the Omaha tribe and the Apsáalooke tribe from the Midwest of the United States. A very tiny wedding gown is on display from the wealthy Inshata-Theumba of the Omaha tribe. You can also admire a warrior robe from the Apsáalooke tribe that men received when they completed important military tasks during their lifetime. The robe is made from buffalo skin and shows drawings of the accomplishments of the wearer. The robe is one of the two robes that has been preserved. While walking through the exhibition you will observe that different tribes have different styles and utensils. The Seminole tribe used a lot of red whereas the Lakota tribe favoured yellow and blue. Hunting weapons are tailored to the different habitats. And where one tribe was primarily interested in woodwork, another completely focused on ceramics and stone. Whomever is interested in such variety should head over to the room on the right side of the oval hall. Modern art from young Indian artists is on display there. You can also enjoy dance and musical performances on a floor lower. Check the program from their website. All in all, the museum is a fun way to become aware of the origins of modern day America. Take about an hour to an hour and a half to visit the larger part of the museum. The museum is also great for the kids. In the library next to the entrance they can play educational games, and downstairs Indian stories are told inside a large tipi.